More and more homeowners are opting to remodel their home and finish the basement than ever before! And an important part of this rush to renovate includes a much more environmentally-conscious and energy-efficient approach. To this end, the Wisconsin Environmental Initiative reports that homeowners are using green products for 40% of all remodeling work [PDF], aiming for really environmentally friendly basement remodeling. Old habits die hard, and green remodeling is relatively new, but these practices are taking over in force. 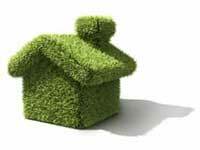 In fact, the Green Tech Forum reports that the number of green homes will increase by tenfold in the next five years! Total Basement Finishing is dedicated to green solutions for your basement remodeling needs. To see what products and ideas we can offer you, contact your local TBF dealer today and schedule a free estimate! What makes a remodeling "green?" It's a question that has been hotly debated by remodeling and home improvement contractors for more than a decade. Green remodeling means finding products that will not hurt the environment as they are created, will last for a long time in your home, make good use of energy in your home, and can be recycled or disposed of safely afterwards. Click here to read about how common basement finishing products measure up! Using "green" building and remodeling practices is more popular than ever. Why? Because it makes sense. Remodeling your home with green products not only helps to save the environment and preserve the world we live in, but it can be a longer-lasting, more comfortable, and much more energy-efficient solution for your home. Click here to read more about how you can save both money and the environment with green remodeling practices! Total Basement Finishing is Green! Just how environmentally friendly is our basement finishing system? From the factory to finishing and beyond, our basement remodeling products are an optimal choice for a durable, energy-efficient, and environmentally friendly finished basement. Total Basement Finishing would like to share a close look at our products and how they tick to see just what they can do for you- and the environment. Click here to take a tour of our healthy and eco-friendly basement finishing system!